I noticed that my pickup is soon going to need new tires. Also, as a diesel, it will need new glow plugs, which cost about $900. I love my truck, but I don’t love the expense of maintaining it. So, I am going to enter into negotiations with Larimer County about donating it to the county, but with some strings attached. I got the idea from reading about the potential donation of Roberts Ranch to Larimer County, Colorado. The deal that was on the table, as I understand it, is that the ranch will remain a ranch in perpetuity and the donor will have a life estate in the property, meaning she will still be able to live there, but the county will pay for operating the ranch and the public will not have access to it like normal open space owned by the county; instead there will only be limited tours and some fishing and hunting permits. That got me thinking. The county can own my pickup. That way I won’t pay the taxes on it for keeping it licensed. It will be in the county’s name. The citizens of Larimer County won’t get my payment of the registration fees and taxes. Instead, they can all chip in as taxpayers. As the owner, the county government will pay for the new tires, glow plugs and other maintenance. I’m especially looking forward to having them pay for fuel. After all, that is part of keeping it running. I will reserve a life estate and thus continue to drive it. If this works out the way I want, I could next donate my law office. The overhead is killing me. The county can pay my rent and other costs of operation. One of the costs of operation will be my salary. That will be a relief for me to not have to worry about. If other lawyers become jealous, they can do their own negotiating. Query: Will the taxpayers of Larimer County be glad to pay for upkeep on a gift that they cannot fully use? Once upon a time, there was a grampa who got a puppy. He loved the puppy and he loved his grandsons, who lived right next door and spent much of their time playing with the puppy. They loved the puppy too. They loved it so much that they did not want another dog of their own. As far as they were concerned, the puppy was theirs too. They shared it with Grampa. They all agreed to a name for the puppy. They called him Buddy. When Grampa died, everyone was sad. They all missed him. They all wanted to honor his wishes about Buddy. The boys continued to play with Buddy and help Gramma take care of him. Gramma told them that when she joined Grampa in Heaven, she wanted the boys to have Buddy for their own. They wanted to please Gramma and even started buying dog food for Buddy so she would not have to get it. They wanted to help pay for feeding their shared dog, Buddy. The boys did not think it was nice of her. They thought it was mean of her to give away the dog they loved, the dog they were raised with, the dog they shared with Grampa, and the dog that Gramma had told them would be all theirs after she died. The newspaper wrote an article about Gramma giving the nice dog Buddy to the children at the orphanage. Many people praised her for helping the children that she did not even know. Those people did not know what she did to her grandsons. Those people did not know that Buddy was the dog they had always had with their Grampa. Those people did not know what Grampa and Gramma had promised. So when they asked the administrators at the orphanage to please tell their Gramma that it would be better for the dog to be with them again, many called them selfish. How could they deprive the orphans of Buddy? Who do you think should have Buddy? Who would take better care of him? Roberts Ranch was homesteaded 138 years ago by ancestors of D.L. (David Lee)Roberts and his sons, Burke and Ben, all three of whom were raised on the ranch. D.L. and Ben still live on the ranch and desire to run the ranch operations. These three men are the only descendants of the founders of the ranch. Catherine Roberts married D.L.’s father, Evan Roberts, after WWII and moved from South Carolina to live on the ranch with Evan. Thus, she is the stepmother of D.L. and step-grandmother of Burke and Ben, as well as widow of Evan. D.L. separately owned part of the ranch, on which his house sits. His sons grew up in the house on that parcel. During his lifetime, Evan made clear that his wishes were for the ranch to stay in the family. His will left part (1/2?) of the ranch to his wife, Catherine, and the rest to his grandsons, Burke and Ben, via a generation-skipping trust. He could have gifted it to an entity such as The Nature Conservancy, CSU, or the county, but did not because he wanted it to stay in the family. After Evan’s death, Catherine entered into negotiations with The Nature Conservancy which resulted in TNC purchasing a conservation easement. I have heard through the local grapevine that, as part of those discussions, it was represented to Catherine that TNC required her to own the entire ranch, so she purchased from D.L. his house and acreage, but he retained a life estate. Similarly she purchased from Burke and Ben the acres that they owned in trust. However, the purchase money also remains in trust, as the land was, and the income from the money in trust is used to pay for Catherine’s living expenses. D.L., Burke and Ben, cooperated in this arrangement because they relied on the representation made by TNC that it could only buy the conservation easement from one person (which I do not see as a legal requirement) and because they desired to follow the wishes of Evan. I have also heard that the price paid by Catherine was a fraction of the appraised value because the grandsons were assured that it would stay in the family upon Catherine’s death. Their only motivation to sell for a token price was to cooperate in fulfilling Evan’s wishes that the ranch continue as an operating ranch and keeping it in one piece. Catherine recently offered to make a gift to Larimer County on the understanding that Roberts Ranch will remain a working ranch. The Coloradoan newspaper reported that there would be limited fishing and hunting on the ranch, as well as occasional (presumably supervised) tours, and a museum in one of the houses on the ranch. Since the story of the potential gift was published, many people have trespassed on the ranch, including 4-wheelers leaving ruts, dirt bikes leaving trails, and people parking horse trailers and taking their horses on rides on this land despite the fact that it is still private property. If Catherine’s motive is to honor the wishes of her late husband, Evan Roberts, why make a gift to the county (or any public or private entity) when his wishes were to have Roberts Ranch remain in the family, and the family consists of his son and grandsons? With the conservation easement already in place, how does a gift to the county preserve the agricultural use any more than does the conservation easement? Isn’t the premature trespassing as described above contrary to the expressed wishes of Catherine Roberts that the ranch should continue to operate as a working ranch and not as county open space used for recreation by the public? If the ranch is not to be public open space, why is the Open Lands Board involved in the decision about accepting the offered gift? What will it cost Larimer County to operate the ranch, including, but not limited to, caring for the cattle herd, irrigating the hay meadows, maintaining the equipment and buildings, hiring a ranch manager and other workers, plus keeping the public off the property other than for approved tours? If a county-run ranching operation is not profitable, is it a proper use of county funds to subsidize a loss? Even if Larimer County does run the ranch at a profit, is it improper for the county to use its resources for competing with private ranchers? If the gift is accepted, won’t the land be taken off the tax rolls and therefore cost the county that revenue? Would the gift put the county in a Catch 22 that it cannot use it for open space without violating the strings attached by Catherine Roberts and, if it is not for open space, what business does Larimer County have operating a ranch? Knowing that the gift might be contested in litigation, is it a good use of taxpayers’ money to pay legal fees for defending a gift that carries the baggage pointed out above? It did not appear that he had suffered. He had not crawled off to the side of the road. He was frozen in a running position. He was not run over. He simply suffered a blow to the side of his head. I will tell myself and Sugar that he died instantly. 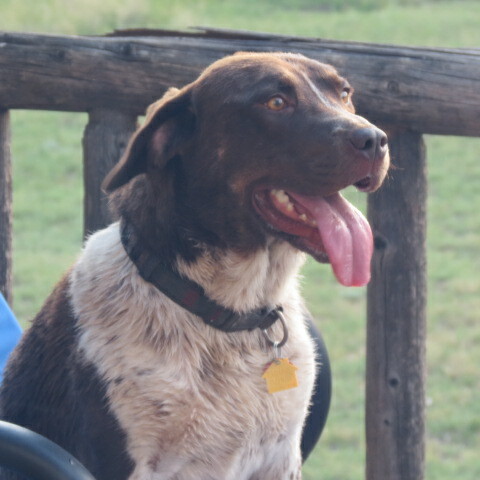 He came into our lives a mere six months ago, last July, during the High Park Fire. He picked us. My first introduction to Rover was when he came up on our deck smiling and wagging his tail. Those of you interested can refer to the blog I wrote at the time, as well as others. We loved him. He was smart, so smart that I am surprised he did not notice an approaching vehicle. He was full of joy. He told us daily, in his cheerful way, that he appreciated us for taking him in. He was eager to please. We miss him. We always will. I like to think that he and Max, who died only 16 days earlier, can hang out together in heaven. Our dog Max, a Yellow Labrador Retriever, definitely received the memo (and genes) about retrieving. He was not “taught” to retrieve. He started when he was a baby puppy, just weeks (not months) old. He would follow a little rubber ball the size of a jacks ball rolling across the floor, pick it up and bring it back. He did have to be taught to drop it. He learned he had to drop the ball or stick for the game to continue. However, we had to be quick or he’d pick it up again. He developed the ability to anticipate where the ball is going and sometimes beat it by going farther (and faster) than the ball traveled through the air, needing then to come back for the ball, like football receivers sometimes do. Consequently, he became the “ball bully” at dog parks throughout the area. Dog owners have had to recognize that bringing one’s dog to a dog park to play fetch can be less fun when a yellow streak beats your dog to its own ball EVERY TIME. It would be like taking your middle schooler to play catch with a football and Champ Bailey kept intercepting it. No fair! We have had to apologize over and over and ultimately stopped taking him to such parks, out of kindness I suppose, for the lesser beings. 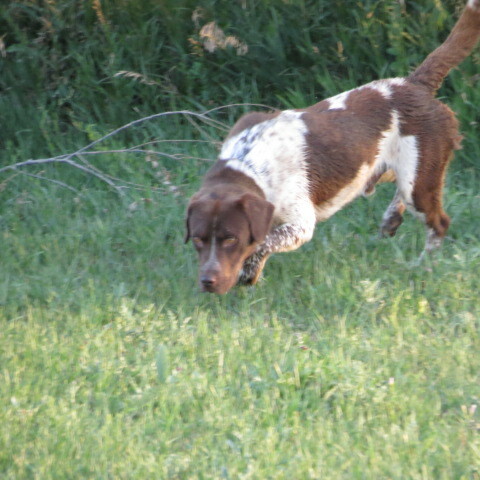 Max displayed an additional talent for an aspect of retrieving beyond rudimentary fetching. That is, on the rare occasions that he lost sight of a ball that landed in the tall grass, Max was not perplexed. Instead, he gladly went about the next task, which was sweeping the area in a series of half circles while his tail wagged like a metronome and his nose was held near to the ground. He covered the ground in a systematic manner with confidence that he would eventually find the hidden ball. To him, the balls were not lost — merely hiding to make the game more interesting. His interest did not waiver. He kept at the sweeping until he successfully found the ball. He was an excellent example of persistence. It was something that he was not taught. I would not know how to teach that. It was a gift delivered through genetic excellence. Some have it; some don’t. You can’t put in what God left out. God did not leave out the instincts that Max was destined to enjoy. I have read that a genius is compelled to follow his or her path. For example, if Mozart had not had piano lessons, he would have played regardless. He had to. His talent, his genius, compelled him to be a musician. Max was born with a genius for retrieving. He had to use his superior talent in such endeavors. That is how God made him. Rover, our German Shorthair Pointer, like all other dogs on earth, never had a chance when competing with Max in chasing balls. However, he tried. 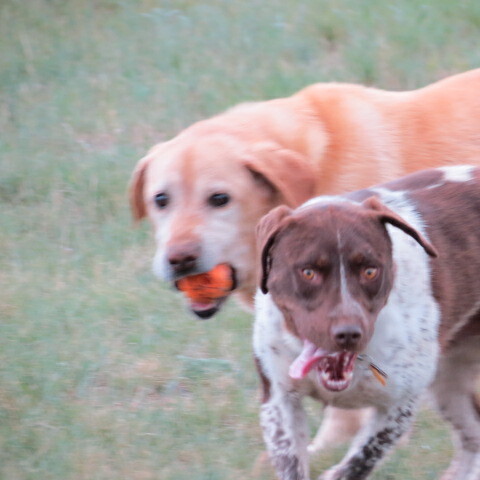 Today he brought us a ball, one belonging to Max, the orange rubber ball with the jingle inside, and we played fetch. And Sugar cried. It is very clear that Rover learned from the master. The torch, I mean ball, has been passed. Today is the day that many folks around the world pause to reflect on the past and set goals for the future, known as New Year’s Resolutions. I am here to help. My help will be valuable for the self-esteem of the multitudes of people who comprise The General Public. My mission is to set you who are in The General Public free from the guilt that comes with broken resolutions by helping you compose a list of resolutions that you are unlikely to break. You are unlikely to break resolutions to do things that you want to do anyway; or, to refrain from doing things that you do not want to do anyway. This is a very successful method of self-help. It is a form of psychological judo. Judo, as I understand it, involves the principle of directing force rather than resisting force. The force about which this advice is directed is called Human Nature. 1. DO NOT PAY AT THE PUMP. The silly, lazy people who purchase fuel by inserting a credit card into the device at the pump suffer from two disadvantages. They miss out on the exercise of walking to the cashier, who is in a building containing a convenience store, and they miss out on the opportunity to buy a treat at the same time as they pay for the fuel. Personally, the closest fuel pumps to my home lack modernistic pay-at-the-pump technology. Not only that, but this convenience store is perhaps the only one in America that has a flight of stairs from the pumps to the cashier. Here is the drill: park by the pump; climb the stairs (even if you are a candidate for a double knee replacement) or, if you are chair-bound, wheel up the ramp on the other side of the building; pre-pay the cashier (which is dangerous as the pumps do not automatically shut off so you pump an incorrect amount at your peril and would have to come back to pay the extra) or, for security reasons, leave your card with the cashier and walk back down the stairs to your vehicle; dispense fuel into your vehicle; climb up the stairs for the second time to sign the slip at which time the customer deserves a treat and if the customer is me, selects a cup of hot chocolate with a few drops of coffee as well as, say, a Snickers bar; and negotiates down the stairs balancing the cup and carrying the candy bar with no free hand to grab the railing, thus calling upon balancing skills while returning to the vehicle. Exercise and a treat! Brilliant! You are welcome! 2. AVOID THE GYM. Especially after purchasing gas where I do, there is no need to pay to go to a gym in order to get on a machine like the Stairmaster. Even if you purchase fuel where stairs are lacking, there are other reasons to avoid the gym anyway. As mentioned above, gyms are crowded in January, I have heard, so you risk exposure to sweaty individuals who might be carrying a contagious disease. That is a reason in the category of self-protection, but I offer a more altruistic reason, which is that your absence make the gym less crowded for others. Doesn’t that make you feel better about yourself? 3. THROW AWAY THE SCALE. It is a well known scientific fact that it is easier to gain weight than to lose it. I know a man, who appears in my mirror, who can watch his food intake for a week, exercise diligently, and lose maybe two pounds, then have one hearty meal and gain five pounds. That is discouraging. That is depressing. That lowers his self-esteem. It is another scientific fact that, on a day to day basis, weight gain is almost imperceptible to the naked eye. Therefore, in order to avoid depression and lowered self-esteem, throw away the scale and just look in the mirror. You will hardly notice any weight gain unless you look at old photos of yourself or until a pesky physician tries to get you on the scale for your physical exam. As the imperceptible daily changes become perceptible after a year without a scale, you can have a resolution for 2018 to throw away all mirrors in your home. If you are keeping up with my irrefutable logic, you will soon enjoy the fruits of success, including positive self-esteem. While others bemoan with shame their broken resolutions, you will smugly smile, secure in your superiority to The General Public for having harnessed Human Nature.